My proposition today, and for many years past, is that learning is 'flat' and has to be 'flat'. Learners need to connect themselves to networks, many networks, and learn from and with the immediate as well as wider world. I am talking about a change in mindset, a shift in pedagogy and an essential purpose for the integration of technology across the curriculum - including mobile computing. 'Flat' or 'Connected' learning is the use of technology to virtually eliminate the walls of the classroom. The walls are 'flattened' through bringing the world into the classroom and opening the classroom, opening the learning to the world. This can happen teacher to student, student to student, student to teacher and include expert advisors, sounding boards, and opportunities to learn from and with anyone. This is bigger than 'flipped' or 'blended' learning. 'Flat' is the superset learning objective, the others are subsets of this whole. 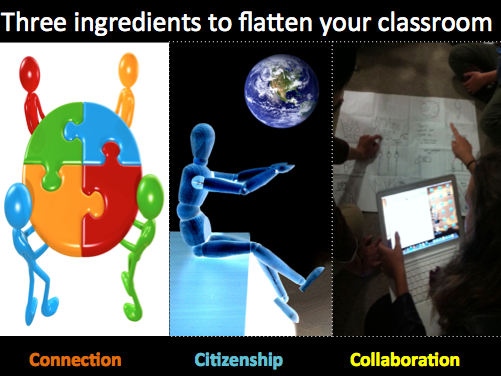 'Flat' learning is important because it connects learners with the world and impacts the context in which we learn. It promotes discovery and engagement with those who are not in the same physical space, and fosters opportunities to develop 21st Century skills, attitudes and habits of learning. Most importantly, adopting 'flat' learning can change the world as we know it - locally and globally - by creating more globally competent and aware learners who have enhanced cultural understanding and experience working with people across the world. 'Flat' learning is the future you say? NO! 'Flat' learning is NOW! How do your 'go flat'? Here is a simple recipe for success.....only THREE ingredients!